I’m 17 years old. It’s my last year of high school. We’re in the final stretch before the summer break. Exams are impending, and after that, freedom. We’re about to become adults. We are kings of the world. Then, we are reminded of our mortality. Over a long weekend where many of the senior students went on a camping trip, Damon Rayan, our friend and student body president is killed in a terrible car accident that hospitalizes two other students. Asleep in a sleeping bag in the back seat, he is thrown out of the window and slams into a tree. The first day back, Tuesday, we struggle with the shock of his death. All the 12th grade students sit in the bleachers in the small gym. When you walk in you can feel the grief. The principal informs everyone that didn’t already know of the news, but by now everyone knows. The next day, a junior loses her battle with cancer. Only months ago, Damon had organized a fundraiser to help pay for her treatments. Our school is gripped with grief. Two weeks later, the school holds a memorial service for the two students. Damon’s best friend plays Coldplay’s The Scientist on his guitar and with a trembling voice, he barely keeps it together through the song. In that moment, Coldplay becomes a permanent memory. They say smell is the strongest trigger for memories, but I think music is a close second. 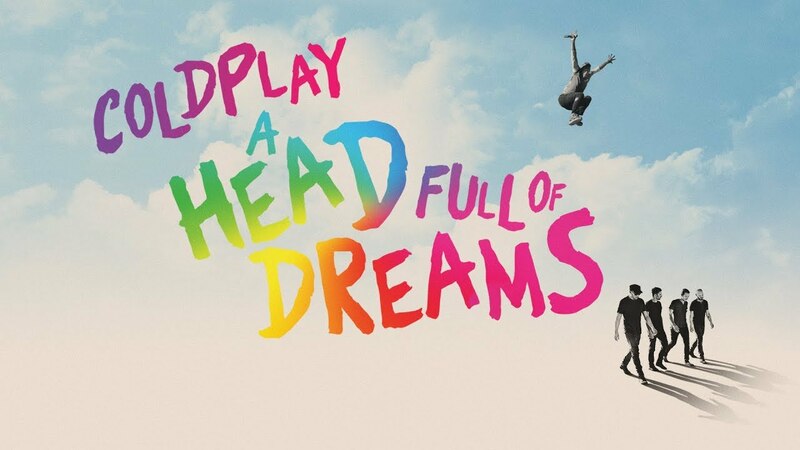 Coldplay’s A Head Full of Dreams tells the story of the band from its inception 20 years ago to where it is today. It’s the story of friendship and how four lads that met at UCL became one of the biggest bands of the early 21st century. It’s also a one night only global event. At 7 PM in 2650 theaters across 70 countries, the show debuts. Lucky enough for me, one of those theaters is Camana Bay on Grand Cayman where I currently live. It was clear that everyone in attendance was a fan of the band. Oddly enough a significant number were Caucasian middle-aged women, mostly dressed up like they came straight to the theatre from work. In line to enter the theater, I overhear snippets of conversations, memories of seeing the band play in concert, of autographs, pictures, marriage proposals, weddings, breakups, childbirth, and death in the family. The endless march of life. 19 years old. I learn to play The Scientist on the piano. I teach the basic chords to a friend. We jam for 10 minutes while improving different melodies. 22 years old. I’m playing Clocks on the piano. Beside me is a girl I’m hoping to impress. She is. 23 years old. Viva la Vida is hot and I can’t get enough of it. I’m alone in Chandler’s car while waiting for my girlfriend to get ready. I push repeat three times. It’s a beautiful summer and everything feels right in the world. “… but that was when I ruled the world.” I get the feeling that this moment won’t last. Two weeks later we break up. There’s an audible murmur in the audience when fan favorite songs came on. Some of the fans rock along, stomping their feet, throwing their hands up. The faint echo of fans singing along with the band’s melodies. I catch myself singing along too. Where the cinema and live concert experience differs is obvious – the cinema is not nearly as raucous and energetic as a live concert. No one is belting lyrics at the top of their lungs. And no one is jumping around to the music (the dirty looks you would get in a theater…). In fact, in the darkness of the theater, you’re almost engaging with the film on your own, in your own personal performance. On a screen that big, the world shrinks and for a moment, the room and everyone in it dissolve. It becomes YOUR experience, YOUR band, YOUR memories. Maybe it’s a byproduct of a documentary like Coldplay’s A Head Full of Dreams that spans the 20 years of their music, friendship, and stories, the fans are reflective and introspective (but energized too) when they emerge from the two-hour showing. Other fans are delighted that they are able to watch Coldplay in their home countries in distant areas of the globe: India, Indonesia, Mongolia, Russia, Thailand. The international reach of the show is a tease for the countries that weren’t on the tour. The fans beg the band to visit them on their next tour. Two ladies chat as they walk out from the show. One shakes her head, “That’s it. That’s part of the appeal. It’s one night. That’s it. It’s done.” The other shrugs. I added my own tweet from the Cayman Islands. 24 years old. Chandler and I are driving through farmland to shovel snow off of our boss’s roof. The windows are stuck in the down position. Strawberry Swing, warm golden light off the snow-covered fields. Everything for a brief moment is that warm golden light. 26 years old. My wife and I have just moved to Boston. I discover Green Eyes, a song I had forgotten about. I realize that this song is for Natalie because she’s “the rock upon which I stand.” It’s convenient that she has green eyes too. 28 years old. I just flubbed an accounting exam. I walk slowly to my 1997 Acura Integra. It’s easily the oldest car in the business school parking lot. I sigh and hold my face up the rain as Fly On plays in my headphones. I watch raindrops slash lines in the in the light of street lamps. 31 years old. Super Bowl halftime show is on in the background. Chris Martin is jumping around the stage, bright colors and streamers fly through the air. The stage is a kaleidoscope of colors. He crouches low on the stage to that glorious guitar riff of Adventure of a Lifetime. I’m visiting Carol, a cancer patient in her home. She’s getting ready for another round of chemo the next day. 33 years old. My wife and I live in the Cayman Islands. I’ve quit accounting and on to my fourth career change. I add Coldplay on my green iPod from 2008. It feels like I’ve reconnected with an old friend. A month later, my client is involved with an international Coldplay release. A Head Full of Dreams is a rush of memories. A day later I think I buy into that marketing hype of the shared fan experience. The Cayman Islands has a population of about 61,000 people—the majority living on Grand Cayman. Out of that population, there were maybe 70 people in the theatre with us watching the film. I don’t know any of those people, but a day later, I really do feel like I shared something special with them. Part of it is the exclusivity, the shared experience of going to this documentary. Part of it is the personal stories and memories of their songs playing to significant memories in my life, the sudden realization that the band has been in the background of much of my adult life. Part of it is the inspiring story of the band itself. And a part of it is the memories of the other fans, their heartaches, their moments of triumphs, the thrill of going to concerts. One night only, and people are able to experience magic again. One night only, but a head full of memories.